Frank Lee’s Muay Thai Kickboxing Gym has been something of a fixture in the Edmonton, Alberta’s Muay Thai and kickboxing scene. And it indeed has some history to it including amongst Frank Lee’s gym’s ranks is Billy Chow movie actor of Jet Li’s films like Fist of Legend. He was also the WKA super welter weight champion in the 80s. Famously, it was also a one time training home for K-1’s Michael McDonald. 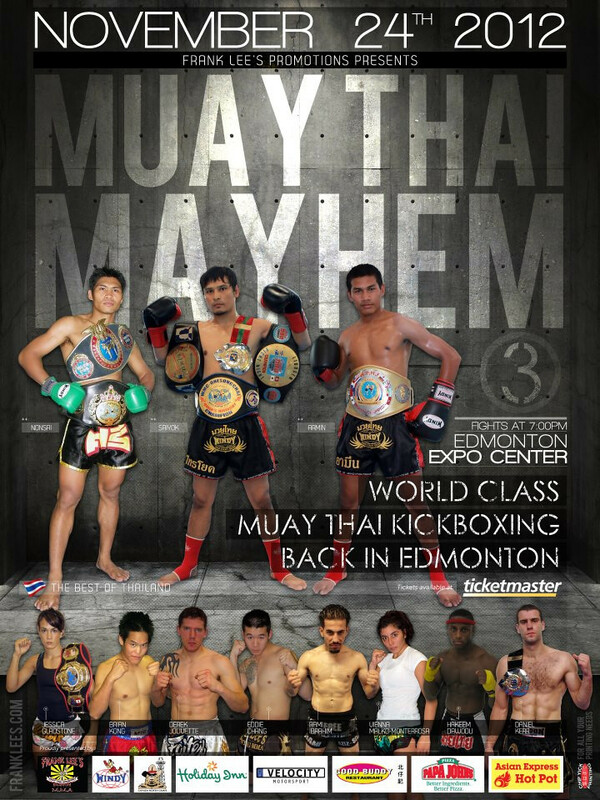 Now Frank Lee is bringing a new card in one of several events Chow’s has brought called Muay Thai Mayhem 3. A quick look at the promotional poster immediately drew my interest featuring Nonsai Sor Sanyakorn, Armin Pumpanmuang Windy Sport, and none other than the Thai Fight competitor Saiyok Pumpanmuang. Both fighters of the Pumpanmuang gym and Nonsai have been active competitors for Elite Boxing’s Thailand Vs. Challenger series. They also have all been feature fighters’ on Thai Promotion Thai Fight’s past events. All 3 Thai Thaiboxers have been very active internationally with most recently Saiyok suffering a loss to Dylan Salvador of France at the Swiss event Roshtigrabe Derby by TKO. They could all be considered current international fighting greats with Armin being touted as the man to assume Buakaw’s mantle as the best known international fighting Thai. The card also features fighters from Frank Lee’s own gym mixed with fighters from Calgary, Alberta. The November 24th timeline comes quickly after the other big Alberta, Canada card Journey Fight Series 8 concludes November 3rd. I for one love that Canada’s Muay Thai scene seems to be getting busier all the time. I am a little surprised though that there isn’t more attention or marketing efforts made to get this fast approaching event more attention. And by all appearances the poster doesn’t lie. That will be some world class Muay Thai. More details are due to emerge soon from the promotional team of Muay Thai Mayhem 3. As a teaser here is Armin at the recent Thai fight in the United Kingdom. ~ by fatsoking on November 6, 2012.